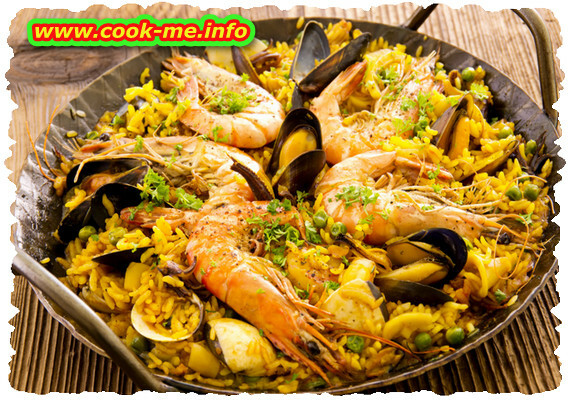 Paella is a dish based on rice , originary from Spain , Valencia region. Easy to cook , ready in 30 minutes. Put the saffron to soak in 4 tablespoons of warm water. Wash the rice and drain it. Heat the olive oil in a pa,n add onions and peppers cutted julienne style. Cook for 5 minutes. Add the rice and pour over it 1 liter of boiling water, add the saffron and mix. Cover it and let it boil at low heat until the rice is almost done. Mix occasionally so it does not stick to the bottom of the pan. Add some water if it dries too much. Add the wine , the peeled shrimps and the mussels and let it boil covered another 5-7 minutes. Add the green peas ( if it is not boiled you have to boil it just just for a little while ) and decorate the dish with greenery.